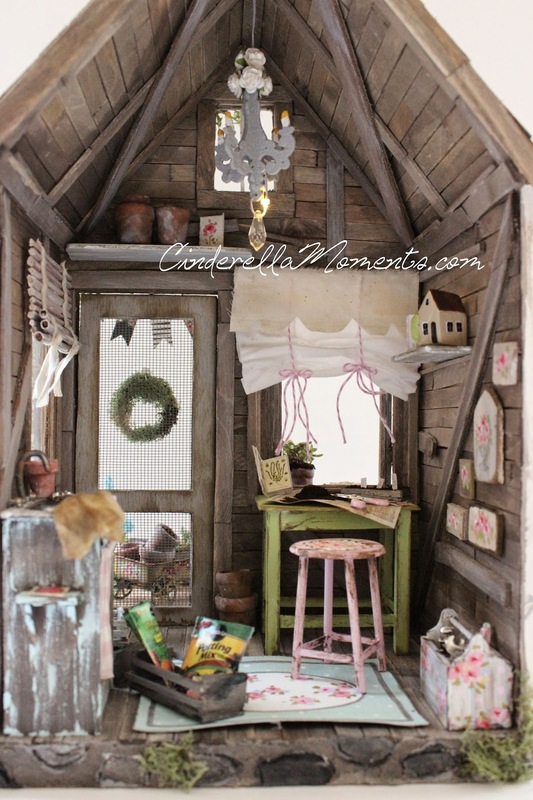 The Garden Shed is just so cute. 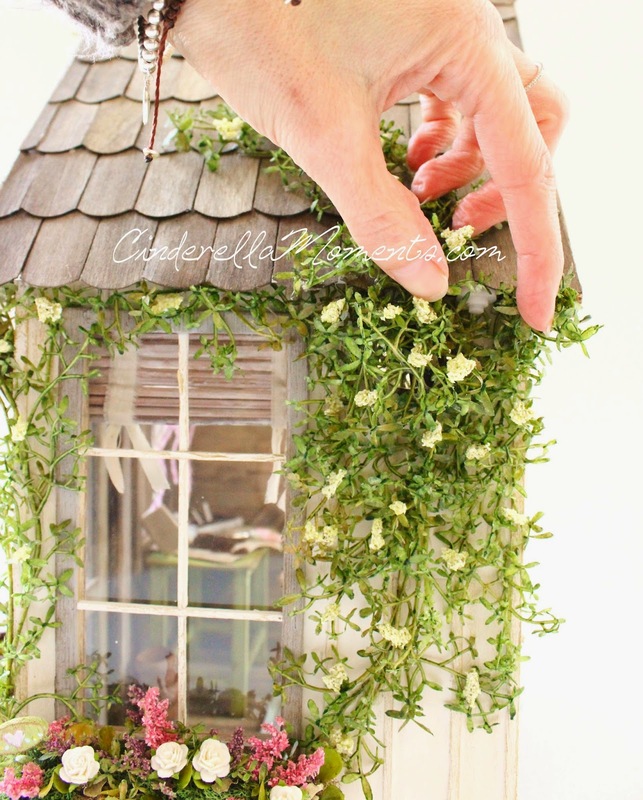 I am always amazed at the detail that you use to make your little houses dreamy and realistic at the same time. And thank you for telling us how you create and paint your items. We have seen the Dallas snow on TV. My brother lives near Austin and had plans to go to Ft. Worth/Dallas but called them off, happy he did. He is a colorado kid but has lived in Texas for so many years that I think he has forgotten snow. You all had more snow than we have had. LOL. I think my fav thing this time is the potatos. We will be planting ours in a couple of weeks. I am glad that you updated us on Lizzy, too. I have been wondering how she likes her new housemate. We have the pointer and a cat whose best freind (only friend) was the last pointer who liked him, too. This new pup will never learn to be kind to the cat. He and Lizzy would have lots of notes to compare. I do carry on. Waiitng for the next little house. 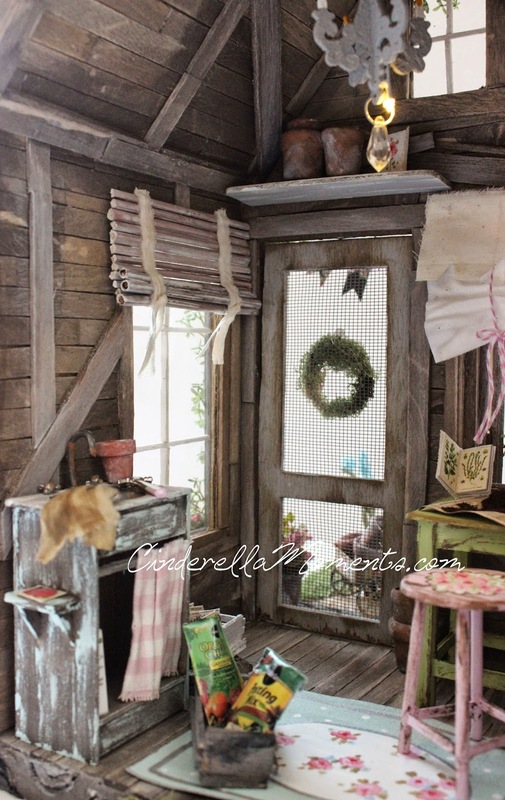 Hi Caroline Just when i think you have made the cutest house then in pops another one, the potting house is adorable! I love it! 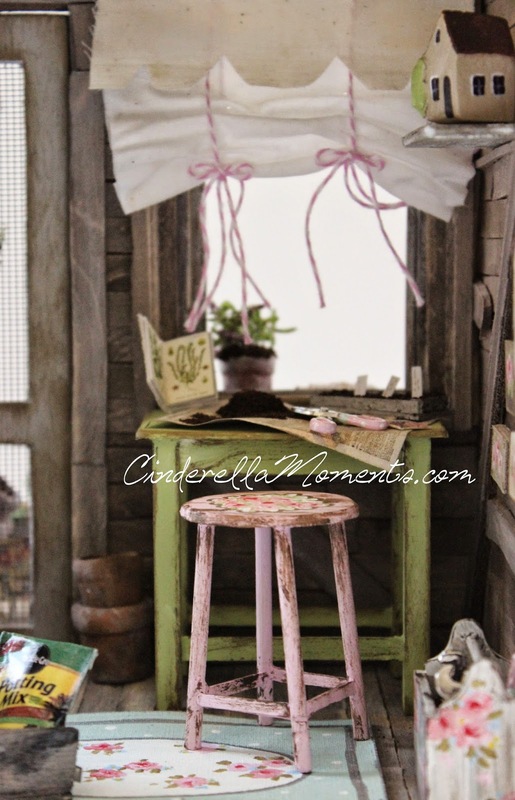 really love the furniture you have made, mine never seems right I guess I need to learn that my messy pieces are AOK! 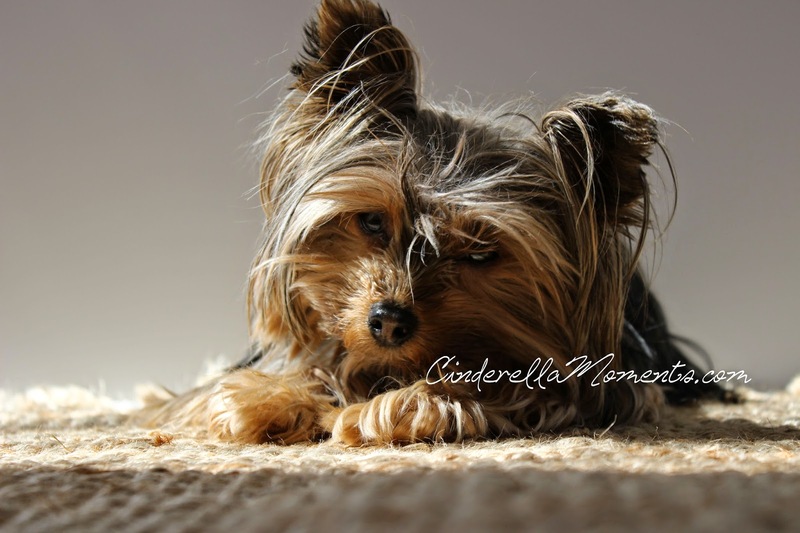 lol what adorable furry friends you have! Love the house - gorgeous. Of course Lizzie and Miss Gigie are adorable too. Greetings from Finland! Lot of snow here also... 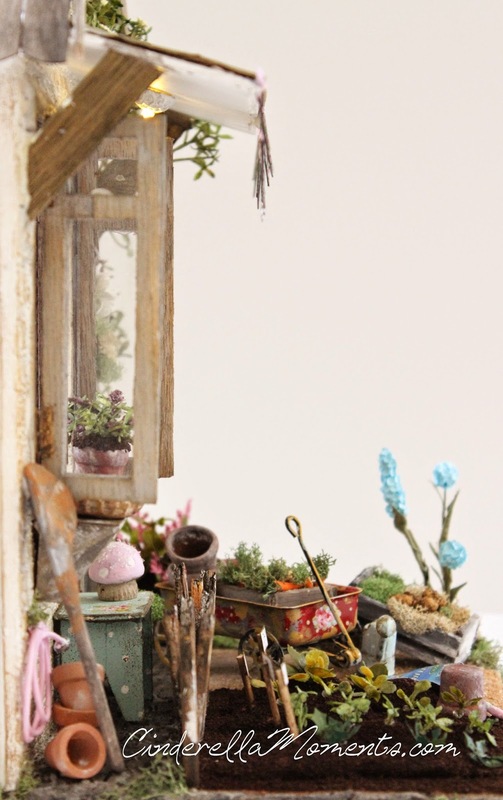 Your shed is so beautifull with lot of amazing little things! I love the harmony of colours. 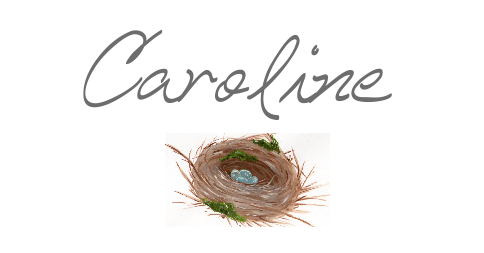 wow, Caroline, you always let me impressed! It is amazing, beautiful ... the cabin is great and the interior is lovely. 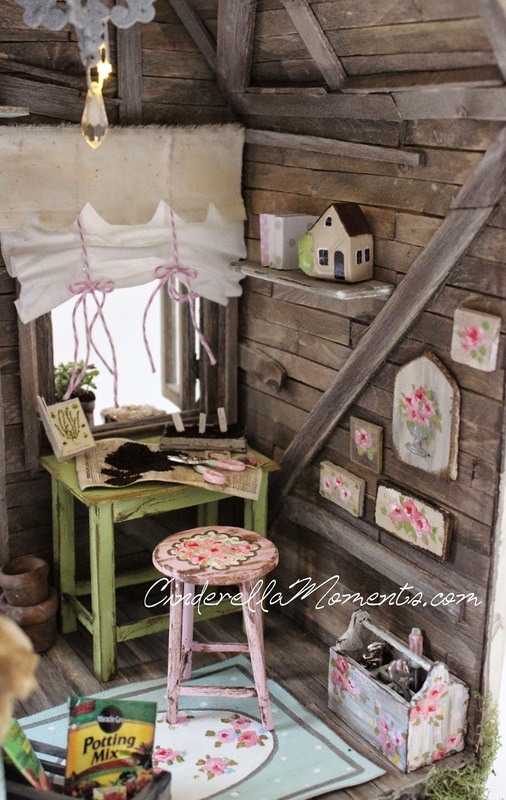 all the details are so adorable .... the car, toolbox, ... could not pick one thing, I love everything and all. one inpresionante work. 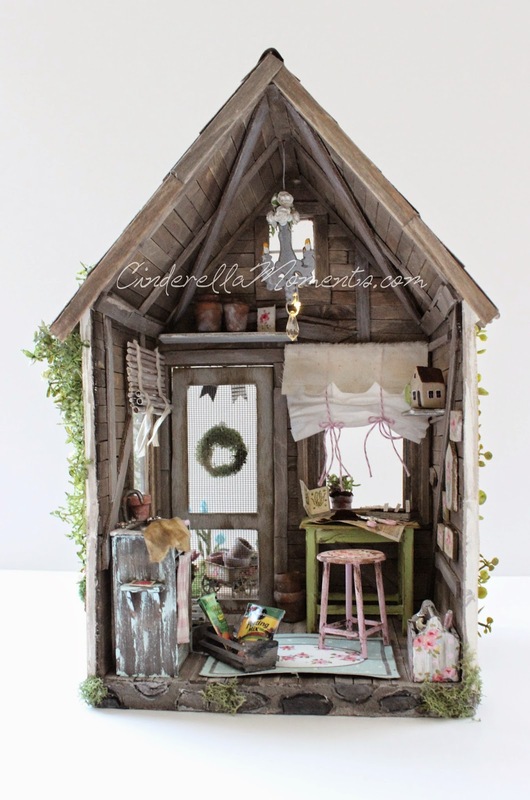 It is really adorable little house, Caroline! All these attractive details outside please me a lot. 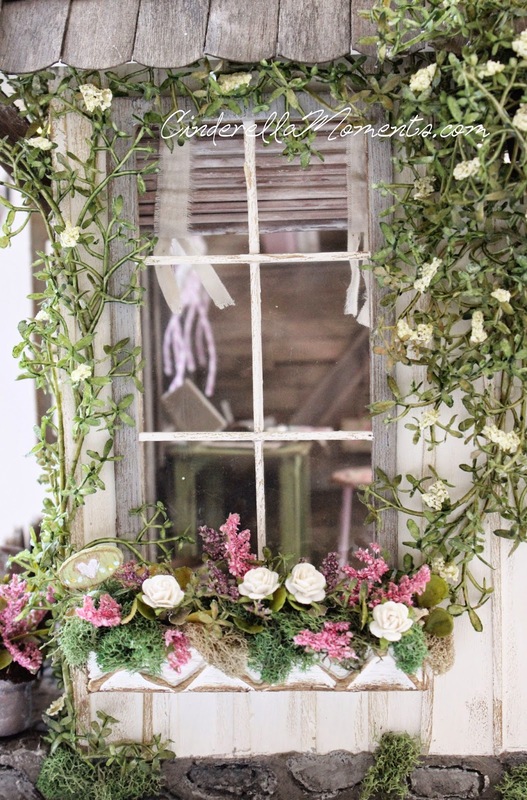 And inside, your furniture and decoration is also beautiful. So cute!!! Congratulations! Gorgeous! Lovely colours! And it makes me want to see plants in my garden. 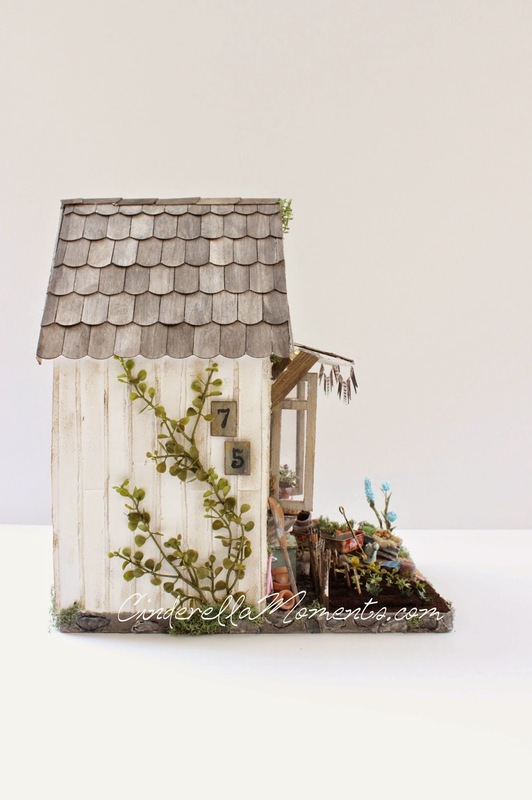 Your little potting shed is so adorable! 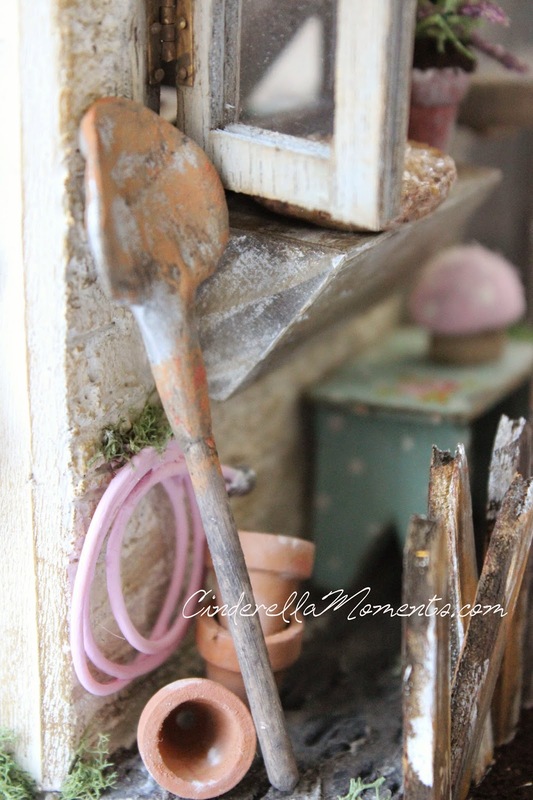 I love the little painted wagon:) I bought a Dura Craft kit from the 80's, called Sweetheart Cottage. 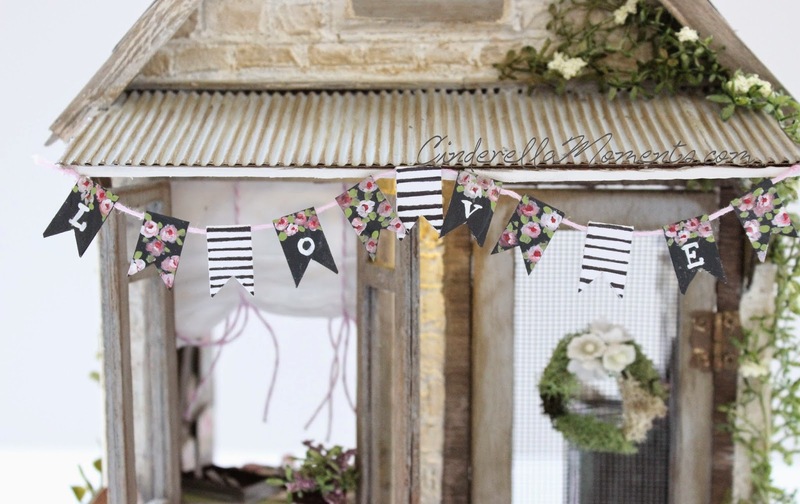 My husband and I are going to Hobby Lobby tomorrow to get some supplies then he's going to help me put it together...I think he's secretly really excited about it too:) I'll be stalking your blog a lot for tips and idea's! Poor Lizzy, she's not loving the cuteness competition she has now but maybe they'll grow to love each other! Wow! 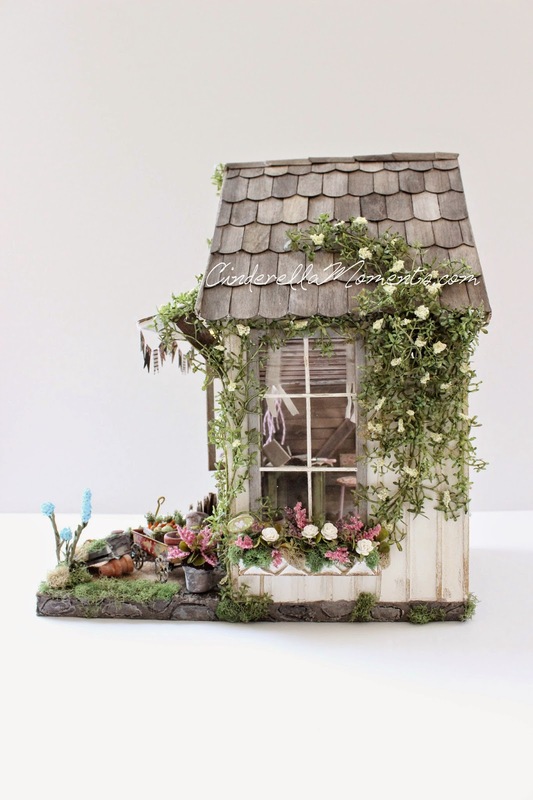 Not only is this little potting house beautiful, it has your special touch. No one can doubt that it is your work. Lizzie and Gigie are adorable. Those bags of dirt really do look like the real deal. I'm impressed! 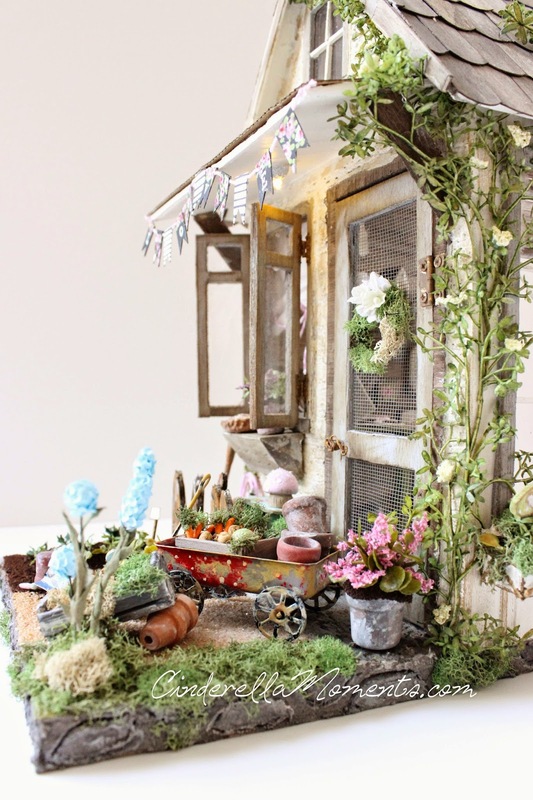 I love the garden... the detail of the pie on the windowsill... THE WAGON!!!! I really love that wagon. It's amazing how expertly you've hidden the light switch. 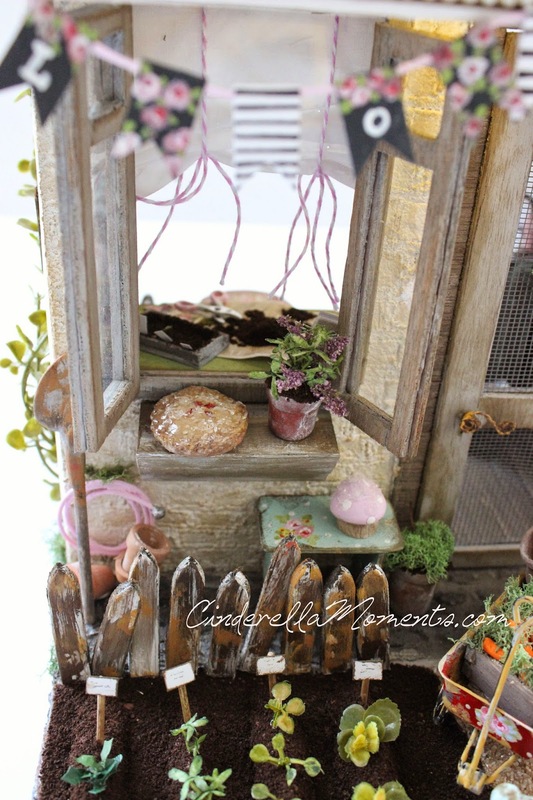 Only yesterday I got out my Tim Holtz miniature light/lantern and am trying to find a way to attach it to my fairy tree. Lighting really does make a house come to life, so I can't wait to use it! I'm super jealous of the snow you've gotten. Dallas seems to get snow every year, and every year I'm so envious of that. (Since Dallas is just a few hours away from me. I live in Warda now). Enjoy your snow!!! I hope your pets enjoy it, too. (I'm even jealous of them in that snow). And don't feel too upset over Lizzie and Gigie's not bonding. 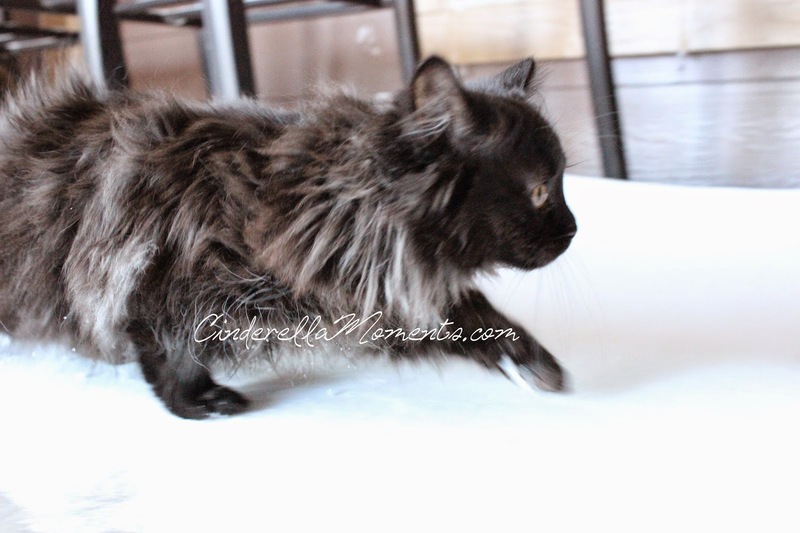 I had two cats, that were mother and daughter, and they hated each other their entire lives. The only time they tolerated one another was once, when they had litters at the same time. (They swapped their kids! It was hilarious to watch). The rest of the time they ignored each other, and would only acknowledge one another with a hiss. But I have a feeling that eventually Lizzie (adorable name!) and Gigie will become better friends. Hi Caroline! 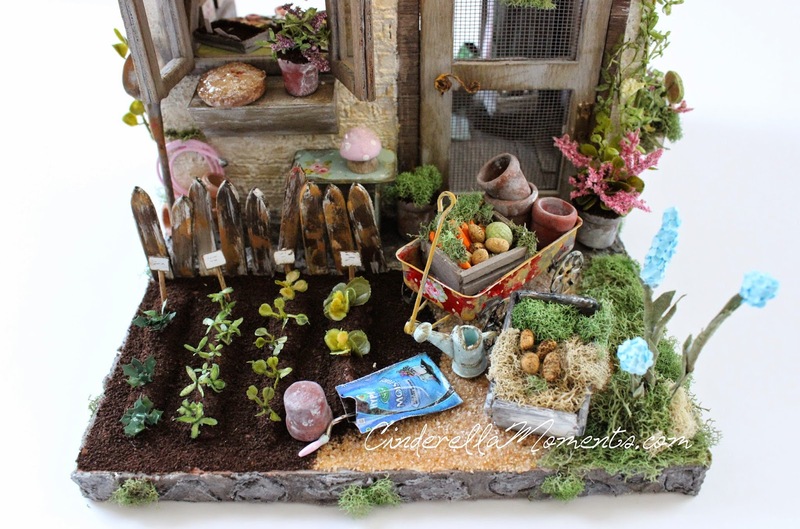 Despite of the snow I think that spring is just around the corner of your house because there are some well growing veggies in the garden ;O!! 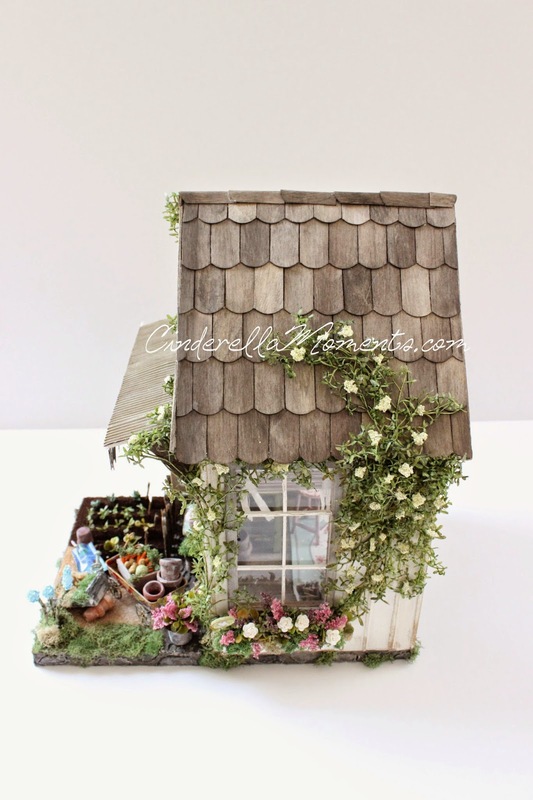 Your new petite maison de jardin is absolutely adorable and so cute to see. Lizzie and Gigie, well, I hope they'll ever love each other ....once :)! But I think both are good photo models, isn't it :D!? 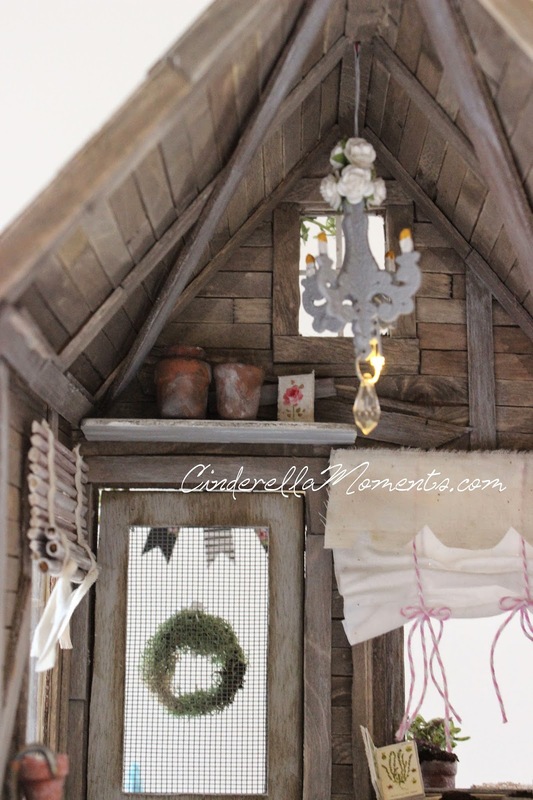 Love the garden shed and garden! Me ha encantado ese pequeño huerto tan bien surtido de vegetales,todos los pequeños utensilios que se pueden necesitar para trabajarlo,las plantas que crecen con vigor subiendo por el precioso cobertizo...es como un cuento hecho realidad!!!!! Disfruta de la nieve y de tus pequeñines Lizzie y Gigie!!!!! Very beautiful and detailed. The vegetable garden is amazing. Прекрасная работа! Вы очень талантливая леди! Ваши работы обладают легкостью и волшебством! Удивительно! Guauu Caroline, me encanta ese cobertizo no le falta de nada, y el huerto está genial. It's adorable Caroline! I love the smaller houses with yardage. 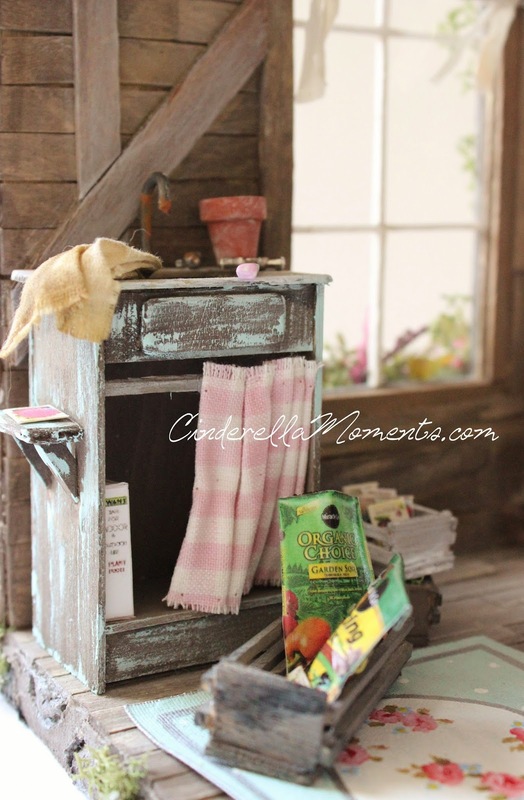 You do so well on the garden and vegetables too! 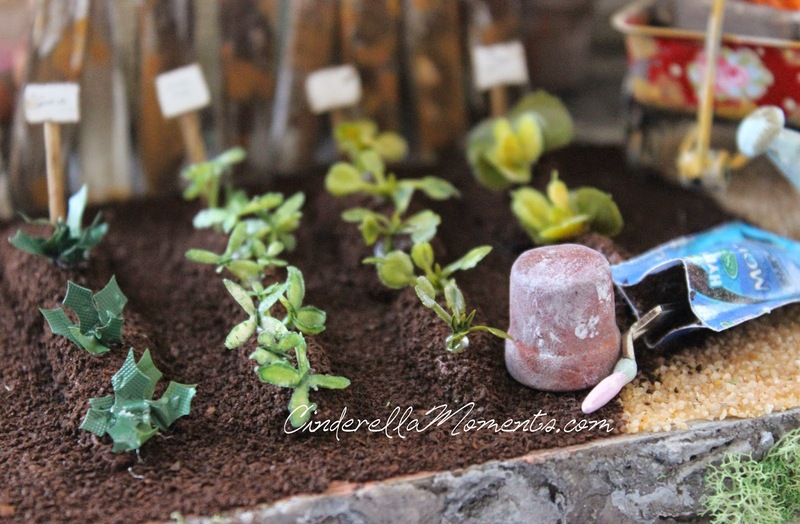 Coffee grounds does look like dirt and your potatoes are sooooo cute! Can hardly wait to get out in the garden now. Maravilloso trabajo, siempre consigues sorprenderme con esas perfectas y mágicas miniaturas. 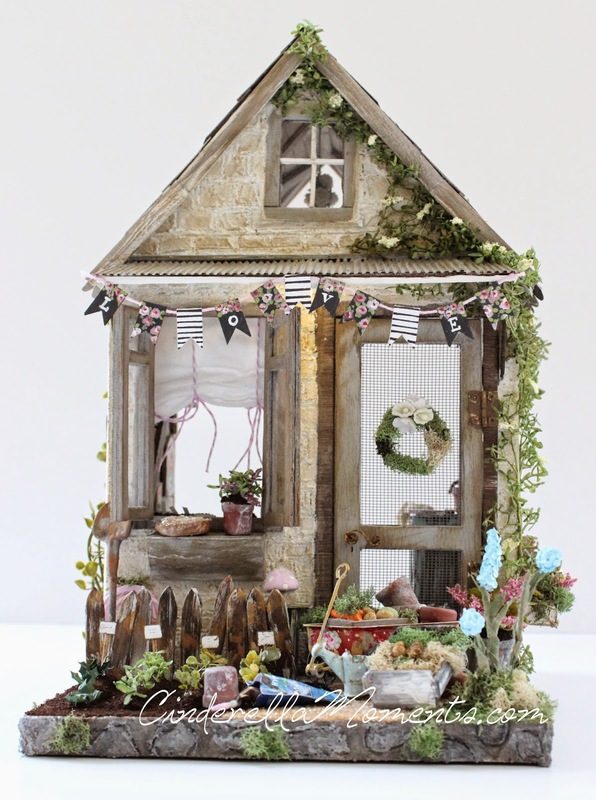 Your little shed and garden are fantastic. I love all the tiny details that make this so adorable. The little wagon is beautiful. 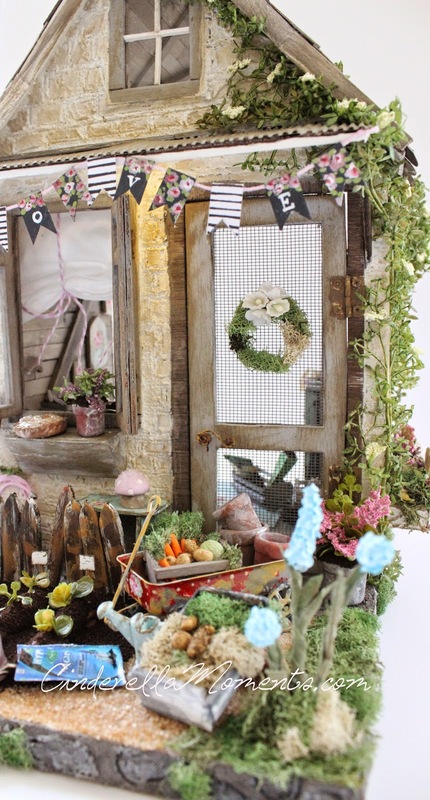 Maravillloso, la casa..el huerto...esas plantas que trepan por la fachada...todo es precioso. Lizzie y Gigie, son como los buenos hermanos, siempre riñendo pero se adoran. 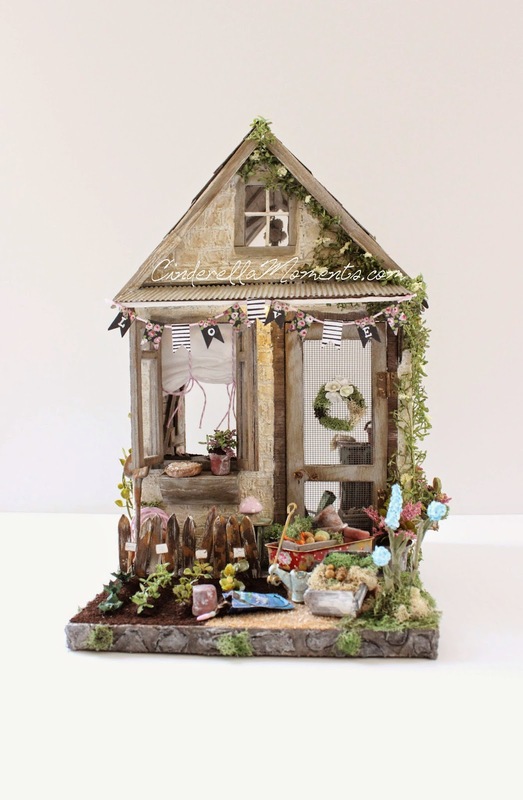 A lovely celebration of Spring even if it doesn't feel like it here in New Hampshire! I love this structure. I want a real one for my back yard... So very cute and very real looking. dan kom ik bij je eten. 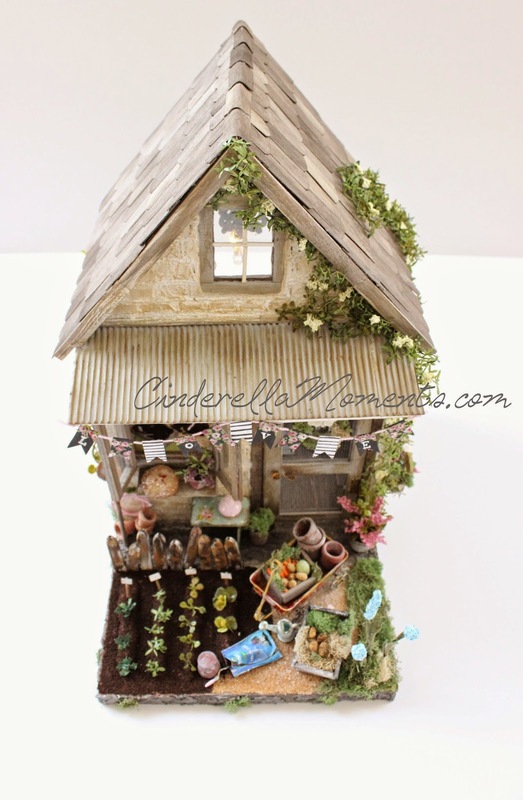 I love this, I love to have it in 1:1 scale =) I'm totally in to gardening this year, but I dont have a garden... 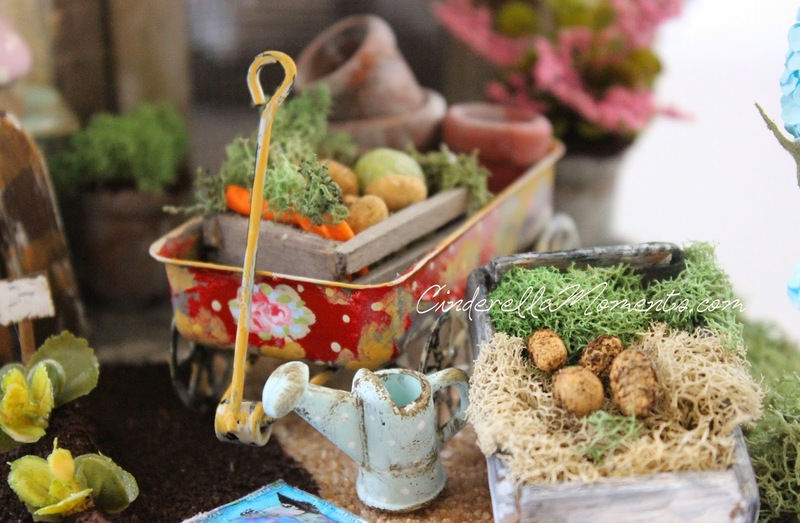 But a big balcony and lot of pots =) I wish I was good at making miniature flowers and gardens, but it is just too hard =) But you always manage to make it so beautiful! Great details, like the pie =) and every thing is just so beautiful and give me a great feeling just looking at it! !